Volnay is a wine appellation that produces some of the finest red Burgundy . 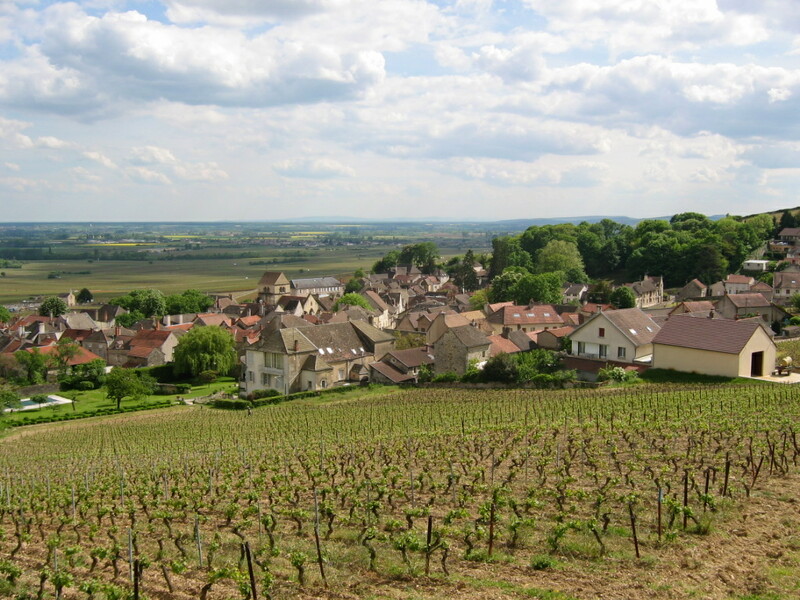 Wine so labeled must come from vines planted in the commune of Volnay (or a portion of the adjoining commune of Meursault) situated in the Côte de Beaune region of the Côte d’Or department of Burgundy in eastern France. Volnay is perhaps the most architecturally aesthetic village in Burgundy. Bordered by Pommard on the northeast, and Meursault to the south, the commune of Volnay lies near the midpoint of the Côte de Beaune. The name Volnay, according to Clive Coates, derives from a Celtic or early Gallic water deity, Volen. The village itself is built around a Romanesque church in the location selected by Hugues IV, Duke of Burgundy. Remnants of the hunting lodge used by the Dukes can be found a short distance from the village. The caves of Domaine Lafarge, which date from the 13th Century, are believed to have been appropriated by the Dukes and incorporated into the Château de Volnay, which was destroyed by fire in 1749. Volnay vineyards cover more than 213 ha. on southeasterly-exposed slopes, of which about 115 ha. are occupied by 26 premiers crus, and about 98 ha. are in village level vineyards. In addition, there are six premier cru parcels, totalling 21 ha., located at the northern extremity of Meursault, but entitled to Volnay appellation. Only red wines are permitted and there are no grands crus. 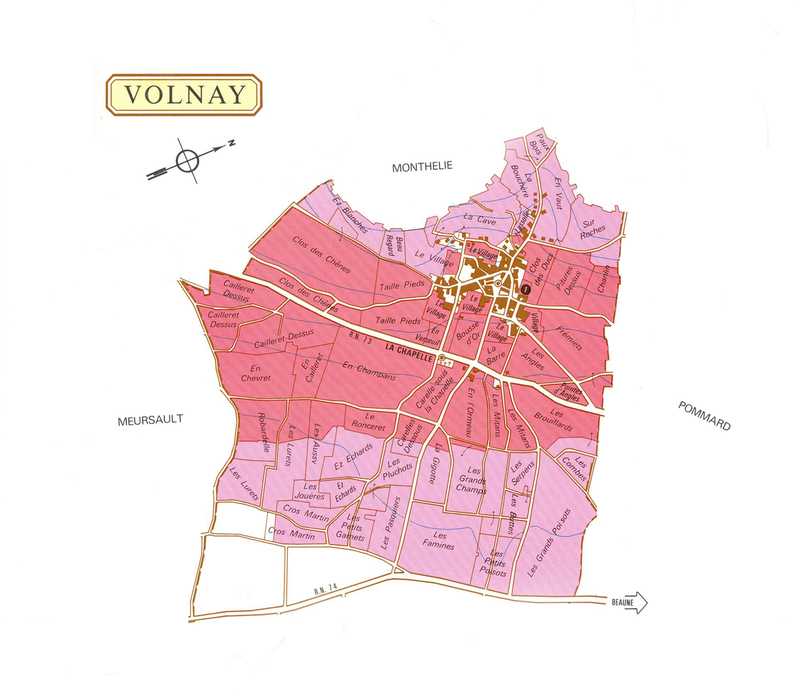 Volnay is unique in that its best vineyards lie below the town (toward RN 74) and not above it, as all other communes of the Cote d’Or. The premier cru vineyards lie at mid-slope, below the town, while the lesser village vineyards are either on higher, more exposed hills above the town, or on lower and flatter terrain nearer RN 74. Some of the best vineyard sites are generally thought to be those immediately adjacent to the town of Volnay: Clos des Ducs, Bousse d’Or, Le Village (which includes several monopoles including Bousse d’Or and Clos du Chateau des Ducs) Carelle-sous-la-Chapelle and Taillepieds. This soil is hard marl with a high percentage of limestone. Another prime cluster of premier cru vineyards is found south of the village toward Meursault: Champans and Caillerets among them. Here the slopes are steeper, with more eroded soils exposing Bathonian limestone, and creating stonier soils. Another distinct section lies northeast of the village toward Pommard. Here the stony soils are predominantly friable schiste. Immediately above the Autun Road (RN 73) is another soil type, the pure limestone of Clos des Chênes. The final major section is the grouping of premier cru vineyards within Meursault, notably the Premier Cru Santenots-du-Milieu. Here the soils exhibit more limestone, but offer a variety of topography and soil type. Volnay has long been celebrated for its elegance and grace. Characterized by seductively fragrant bouquets, the wines display intense but delicate pinot noir flavors. Volnay is often and justifiably described as “feminine” on account of its charm and refinement. The “Big Three” domaines producing fine Volnay are generally conceded to be Michel Lafarge, Domaine de Montille and Marquis d’Angerville. Volnay � Jockovino” ended up being terrific. I am producing out a replicate to demonstrate to my personal buddys.